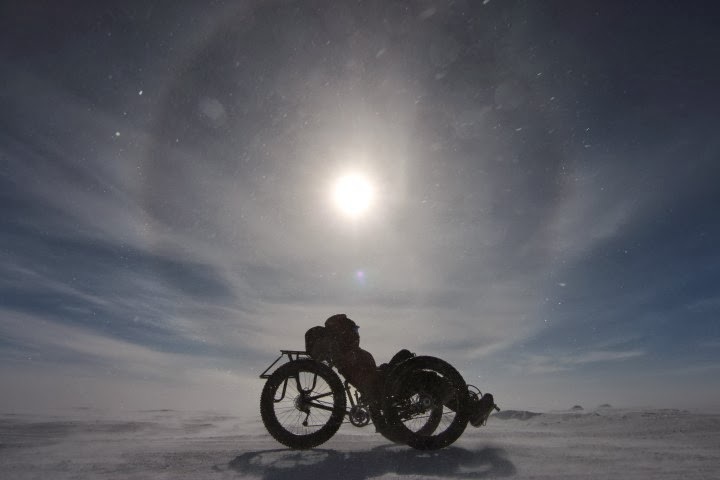 Maria Leijerstam rides her custom recumbent tricycle in Antarctica. On the day after Christmas, 35-year-old British endurance cyclist Maria Leijerstam became the first person to cycle from the Antarctic Coast to the South Pole. Using a specially designed recumbent tricycle and starting at a virtual shoreline near the base of the Leverett Glacier on a research station resupply route called the South Pole Traverse, Maria completed her 400-mile ride in ten and a half days. Leijerstam won the media-driven but otherwise mostly non-existent “race” to the pole between her two men on traditional fat bikes, American Daniel Burton and Spaniard Juan Menendez Granados. Both men started more than two weeks before Leijerstam at the more traditionally traveled South Pole route, which is closer to 700 miles in length and also starts at a virtual shoreline at the ice-bound Hercules Inlet. The men are still at least two weeks away from the South Pole, and were still slogging away between 85 and 86 degrees latitude while Leijerstam made her way back to the coast as a passenger in an Arctic Truck. For a bit of perspective, Leijerstam started her journey near Latitude 85. Leijerstam credited the aerodynamic design of her tricycle, meticulous planning, focused training, and a carefully chosen route for her success. While not a traditional highway by any stretch of the imagination, the South Pole Traverse was developed for vehicular traffic by filling in crevasses and flagging the route around more difficult obstacles. It’s also used fairly regularly during the summer by a convoy of giant tractors, creating tracks that would offer a packed, feasibly faster and smoother surface than the sun- and wind-affected crusts of untrammeled snow. The South Pole Traverse makes sense for human-powered travel as well, but it has not seen much use from adventurers because passage on this route can be significantly more expensive. Antarctic Logistics and Expeditions, a company that provides expedition support and tours to the interior of Antarctica, bases its operations on the Hercules route. The company charges a much higher fee to support any other part of the continent. Leijerstam’s expedition had a number of sponsors and was filmed for an upcoming television documentary. Although she started out the expedition unsupported, meaning she was carrying all of her food and supplies for the duration of the journey, after three days of climbing more than 2,000 meters up the Leverett Glacier, she made the decision to unload all of her gear on the trucks that were shadowing her and filming the journey. “Made the tough decision to unload my kit mid morning as my pace meant i would miss my cut off,” she tweeted. What’s strange about this decision is that Leijerstam reached the South Pole in ten days after originally predicting that the journey would take twenty days. It seems like she was never behind schedule but opted to give up her unsupported status all the same, possibly in the interest of establishing a stout speed record. And, indeed, after she completed her journey, her support team touted two world records — not only being the first person to cycle to the pole, but also beating all other human-powered speed records. ExplorersWeb, viewed as the top resource for polar expeditions, was quick to dispute the speed claim. “This is a motorized expedition and should not be compared to man-hauling skiing expeditions,” the organization wrote. ExplorersWeb tends to show no love for supported expeditions, and is quick to dispute or clarify claims of heavily media-hyped achievements, such as British television personality Helen Skelton’s “kite-ski speed record” during her 500-mile Antarctic journey in 2012. And, indeed, Leijerstam’s expedition had some of the unfortunate markers of a television stunt — extreme secrecy until the expedition actually started, press releases strung with superlatives and some inaccuracies, and, of course, the presence of a film crew. As a fan of Antarctic adventures and a fat bike enthusiast, I’m thrilled that a woman was the first to successfully pedal to the South Pole. However, I’m among those who are disappointed that it was achieved in this style — shuttling to a point hundreds of miles from open ocean, with support crews and cameras shadowing every step (or pedal stroke) of the way, in an expedition so short that, as one forum commenter put it, “there’s not even time for your underwear to start stinking.” Certainly, Leijerstam was the first and executed an impressive plan and a remarkable feat of endurance. Whatever accolades she receives are deserved, but ultimately some of us may end up viewing the resulting media and wondering how much of it was real, and how much of it was reality TV. Truly innovative adventuring can not be easy in the modern era. It takes several hundred thousand dollars to support some of these expeditions, and as a result adventurers are heavily pressured to produce something tangible for their sponsors in return. No one in the general public will care about the “style” in which something was achieved, so long as there is a tangible achievement. Leijerstam’s world first was exactly that. She did what it took to get there. It’s true that nothing about Antarctica is as pure as it was in the heroic age of polar exploration, when adventurers such as Scott, Amundsen, and Shackleton were making headlines. Trucks and tractors rumble across the ice as planes buzz overhead. The South Pole is now a massive base with year-round operations, a virtual space station in one of the harshest and most inaccessible regions on the planet. 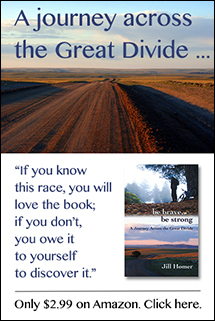 But the mystique and appeal is still there, which is why dreamers will continue to draw on the pioneering expeditions to continue taking bicycles where they’ve never been taken before. On expedition secrecy, I once went to see Ranulph Fiennes speak and his advice was to keep it secret until the last minute or “the bloody Norwegians will try to beat you to it”. I have been following Dan and Juan since they started and was shocked when Maria won, simply because I was unaware of her attempt. While Maria’s feat is remarkable, she had support in several forms – an incredibly expensive, purpose made recumbent, a film team following along and trucks at the ready in case she had problems. Also, she rode a route where the crevasses had been filled in or flagged and was almost half as long as the route being ridden by Dan and Juan, both of whom have been riding by themselves with fairly normal, fat tire bikes, at times, over unmarked crevasses. 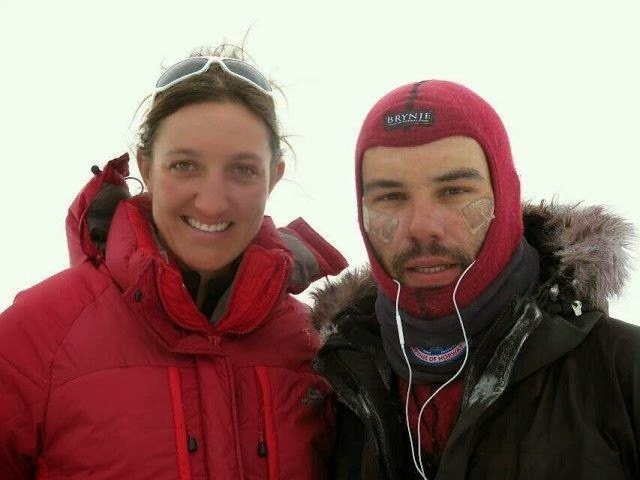 The person in the tent whom Leijerstam and team passed was Robert Parks who was on a ski-only expedition. Burton has been about a half day behind Granados, adhering to a sportsman’s protocol which protects the solo, unsupported, unassisted status of Parks and Granados. correction: Richard Parks. Parks is a former rugby player from Wales, from which Leijerstam also hails. I’m also confused by Maria’s claim that she “peddled every metre” when her team posted early in the trip that she had to drag the bike with a harness up the steep hills, and in her own posts she also made reference to the harness. Was the initial climb up the glacier not officially part of the route or something? Hi again, I did in fact cycle every metre of the way and didn’t push, pull or carry any part of it, even up the glacier. It was a mis-understanding in the article written that I had to drag my polar cycle. I did wear a harness for the steepest section but this was only because if I had come off the polar cycle in some way, I would have lost did down the glacier!….hopefully that puts some perspective on how steep it was. Hi all, Maria Leijerstam here – great article. I do just want to clear up that I had no sponsors it was totally self funded and I’m now in the most horrendous dept ever! Secondly I had no camera crew, it was my boyfriend with this own camera. I tried desperately for 2 years to get a sponsor but it didn’t materialise. I was only driven my my own goal to be first to the pole, no media what so ever. Also I’m not trying to claim any expedition of huge human sacrifice, I’m simply trying to demonstrate that it’s about time to modernise polar travel and there are other ways of doing it other than skiing. Having said that I do believe it is pointless to try and cycle the hercules route because it is impossible to cycle unless there is a track. I’ve seen it with my own eyes. I was unsupported until day 5 and after that i was supported because the truck carried my kit. Looking back, yes i could have done it unsupported but having had 2 very tough day I thought I might not make it and the trucks had to be back by a certain date. Retrospect can only be learned from but I do not regret my decision. Final point, everyone in Antarctica must carry a sat phone and make a 24hour call. For them it might take 6-7hrs for help to arrive for me with a truck nearby might have only taken an hour. These days we are no longer explorers such as the Scotts and Amundsens as they had no helpline, We need polar travel to move into the 21st century…..just my view anyway. Thank you for taking the time to reply to my blog post. I appreciate you clearing up the misperceptions and voicing your intentions. I intend to write an update soon as Juan and Dan approach the pole, and will mention your comments in the next article. I hope you don’t perceive my commentary as disrespect. Anyone who’s a fan of polar exploration has their own views about this sort of thing, but to take the initiative and get it done is what counts, and of course I’m incredibly impressed with what you achieved. Hearing a touch more of the backstory adds to this awe, and I apologize for assuming you had sponsors. I look forward to learning more when your documentary is released. Supported or not, what she did is impressive. I couldn’t do it. I’m currently training with hopes of doing RAAM eventually. If I had an offer of full funding and everything needed to do what she did, I would likely answer with a resounding “HELL NO! I’m just not that crazy”. All the respect in the world for her and everyone else attempting it. And to the crtitics- unless you’re willing to get out there and do it yourself, you don’t have much room to talk.